Capacitors do not behave the same as resistors. Whereas resistors allow a flow of electrons through them directly proportional to the voltage drop, capacitors oppose changes in voltage by drawing or supplying current as they charge or discharge to the new voltage level. The flow of electrons “through” a capacitor is directly proportional to the rate of change of voltage across the capacitor. 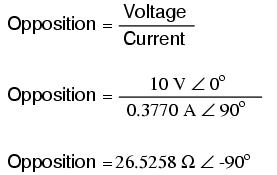 This opposition to voltage change is another form of reactance, but one that is precisely opposite to the kind exhibited by inductors. Voltage lags current by 90o in a pure capacitive circuit. In a pure capacitive circuit, the instantaneous power may be positive or negative. As with the simple inductor circuit, the 90 degree phase shift between voltage and current results in a power wave that alternates equally between positive and negative. This means that a capacitor does not dissipate power as it reacts against changes in voltage; it merely absorbs and releases power, alternately. A capacitor's opposition to change in voltage translates to an opposition to alternating voltage in general, which is by definition always changing in instantaneous magnitude and direction. For any given magnitude of AC voltage at a given frequency, a capacitor of given size will “conduct” a certain magnitude of AC current. Just as the current through a resistor is a function of the voltage across the resistor and the resistance offered by the resistor, the AC current through a capacitor is a function of the AC voltage across it, and the reactance offered by the capacitor. 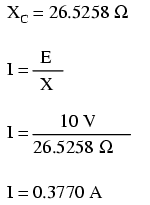 As with inductors, the reactance of a capacitor is expressed in ohms and symbolized by the letter X (or XC to be more specific). Please note that the relationship of capacitive reactance to frequency is exactly opposite from that of inductive reactance. Capacitive reactance (in ohms) decreases with increasing AC frequency. 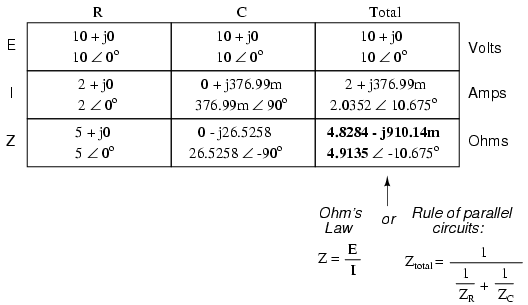 Conversely, inductive reactance (in ohms) increases with increasing AC frequency. Inductors oppose faster changing currents by producing greater voltage drops; capacitors oppose faster changing voltage drops by allowing greater currents. 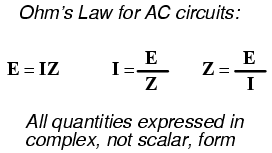 As with inductors, the reactance equation's 2πf term may be replaced by the lower-case Greek letter Omega (ω), which is referred to as the angular velocity of the AC circuit. Thus, the equation XC = 1/(2πfC) could also be written as XC = 1/(ωC), with ω cast in units of radians per second. However, we need to keep in mind that voltage and current are not in phase here. As was shown earlier, the current has a phase shift of +90o with respect to the voltage. 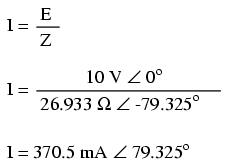 If we represent these phase angles of voltage and current mathematically, we can calculate the phase angle of the capacitor's reactive opposition to current. Voltage lags current by 90o in an inductor. Mathematically, we say that the phase angle of a capacitor's opposition to current is -90o, meaning that a capacitor's opposition to current is a negative imaginary quantity. 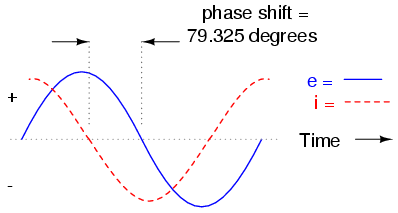 (Figure above) This phase angle of reactive opposition to current becomes critically important in circuit analysis, especially for complex AC circuits where reactance and resistance interact. It will prove beneficial to represent any component's opposition to current in terms of complex numbers, and not just scalar quantities of resistance and reactance. Capacitive reactance is the opposition that a capacitor offers to alternating current due to its phase-shifted storage and release of energy in its electric field. Reactance is symbolized by the capital letter “X” and is measured in ohms just like resistance (R). Capacitive reactance decreases with increasing frequency. In other words, the higher the frequency, the less it opposes (the more it “conducts”) the AC flow of electrons. 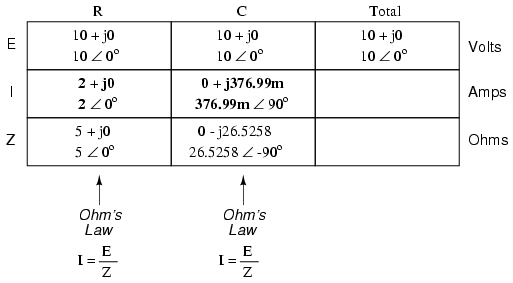 In fact, this is a far more comprehensive form of Ohm's Law than what was taught in DC electronics (E=IR), just as impedance is a far more comprehensive expression of opposition to the flow of electrons than simple resistance is. Any resistance and any reactance, separately or in combination (series/parallel), can be and should be represented as a single impedance. 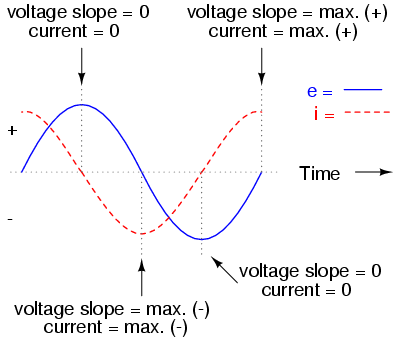 To calculate current in the above circuit, we first need to give a phase angle reference for the voltage source, which is generally assumed to be zero. (The phase angles of resistive and capacitive impedance are always 0o and -90o, respectively, regardless of the given phase angles for voltage or current). Voltage lags current (current leads voltage)in a series R-C circuit. Notice how the voltage across the resistor has the exact same phase angle as the current through it, telling us that E and I are in phase (for the resistor only). The voltage across the capacitor has a phase angle of -10.675o, exactly 90o less than the phase angle of the circuit current. This tells us that the capacitor's voltage and current are still 90o out of phase with each other. Once again, SPICE confusingly prints the current phase angle at a value equal to the real phase angle plus 180o (or minus 180o). However, it's a simple matter to correct this figure and check to see if our work is correct. 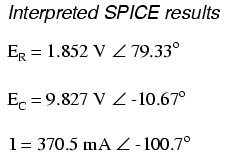 In this case, the -100.7o output by SPICE for current phase angle equates to a positive 79.3o, which does correspond to our previously calculated figure of 79.325o. Again, it must be emphasized that the calculated figures corresponding to real-life voltage and current measurements are those in polar form, not rectangular form! For example, if we were to actually build this series resistor-capacitor circuit and measure voltage across the resistor, our voltmeter would indicate 1.8523 volts, not 343.11 millivolts (real rectangular) or 1.8203 volts (imaginary rectangular). 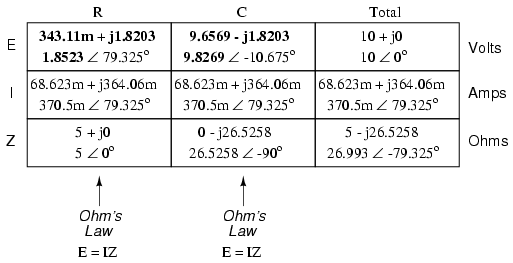 Real instruments connected to real circuits provide indications corresponding to the vector length (magnitude) of the calculated figures. While the rectangular form of complex number notation is useful for performing addition and subtraction, it is a more abstract form of notation than polar, which alone has direct correspondence to true measurements. Series: R-C circuit Impedance phasor diagram. Given: A 40 Ω resistor in series with a 88.42 microfarad capacitor. Find the impedance at 60 hertz. 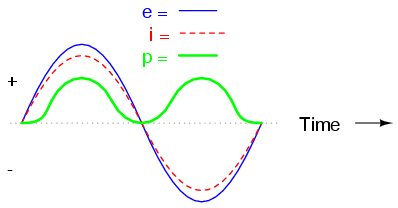 Impedance is the total measure of opposition to electric current and is the complex (vector) sum of (“real”) resistance and (“imaginary”) reactance. Please note that impedances always add in series, regardless of what type of components comprise the impedances. That is, resistive impedance, inductive impedance, and capacitive impedance are to be treated the same way mathematically. A purely capacitive impedance will always have a phase angle of exactly -90o (ZC = XC Ω ∠ -90o). When resistors and capacitors are mixed together in circuits, the total impedance will have a phase angle somewhere between 0o and -90o. When resistors and capacitors are mixed together in parallel circuits (just as in series circuits), the total impedance will have a phase angle somewhere between 0o and -90o. The circuit current will have a phase angle somewhere between 0o and +90o. As with inductors, the ideal capacitor is a purely reactive device, containing absolutely zero resistive (power dissipative) effects. In the real world, of course, nothing is so perfect. However, capacitors have the virtue of generally being purer reactive components than inductors. It is a lot easier to design and construct a capacitor with low internal series resistance than it is to do the same with an inductor. The practical result of this is that real capacitors typically have impedance phase angles more closely approaching 90o (actually, -90o) than inductors. Consequently, they will tend to dissipate less power than an equivalent inductor. Capacitors also tend to be smaller and lighter weight than their equivalent inductor counterparts, and since their electric fields are almost totally contained between their plates (unlike inductors, whose magnetic fields naturally tend to extend beyond the dimensions of the core), they are less prone to transmitting or receiving electromagnetic “noise” to/from other components. For these reasons, circuit designers tend to favor capacitors over inductors wherever a design permits either alternative. Capacitors with significant resistive effects are said to be lossy, in reference to their tendency to dissipate (“lose”) power like a resistor. The source of capacitor loss is usually the dielectric material rather than any wire resistance, as wire length in a capacitor is very minimal. Dielectric materials tend to react to changing electric fields by producing heat. This heating effect represents a loss in power, and is equivalent to resistance in the circuit. The effect is more pronounced at higher frequencies and in fact can be so extreme that it is sometimes exploited in manufacturing processes to heat insulating materials like plastic! The plastic object to be heated is placed between two metal plates, connected to a source of high-frequency AC voltage. Temperature is controlled by varying the voltage or frequency of the source, and the plates never have to contact the object being heated. 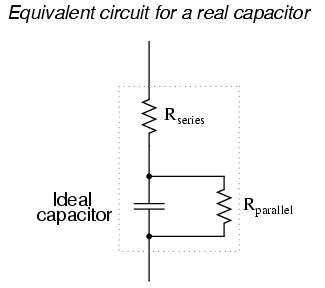 Real capacitor has both series and parallel resistance. Fortunately, these stray resistances are usually of modest impact (low series resistance and high parallel resistance), much less significant than the stray resistances present in an average inductor. Electrolytic capacitors, known for their relatively high capacitance and low working voltage, are also known for their notorious lossiness, due to both the characteristics of the microscopically thin dielectric film and the electrolyte paste. Unless specially made for AC service, electrolytic capacitors should never be used with AC unless it is mixed (biased) with a constant DC voltage preventing the capacitor from ever being subjected to reverse voltage. Even then, their resistive characteristics may be too severe a shortcoming for the application anyway.